Hope everyone is enjoying the Bank Holiday weekend! Today's post is all about fun makeup to make the most of those late Summer nights when the heat is still on - Summer's not over yet! 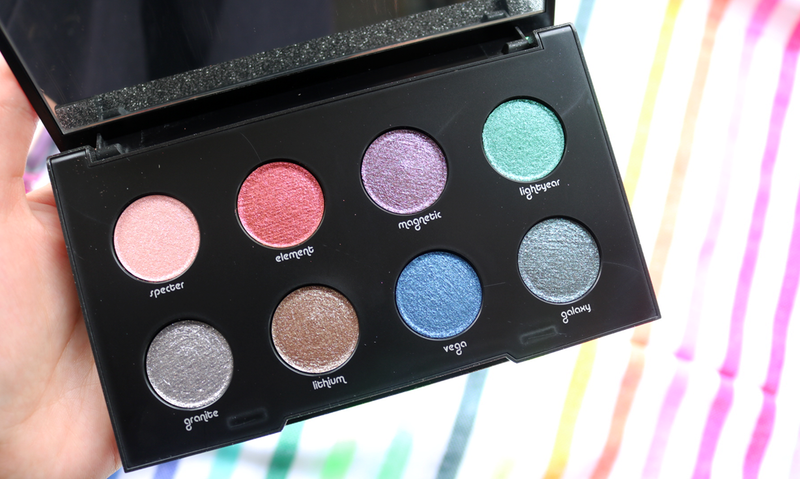 Are you missing a badass colourful glitter eyeshadow palette in your makeup collection? 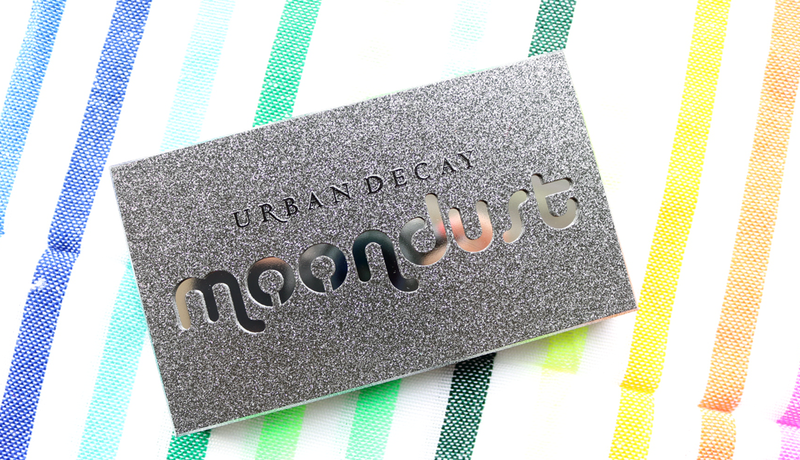 If you are, Urban Decay's Moondust Eyeshadow Palette will keep your lids looking awesome for every single festival you're planning to go to for at least the next ten years! The packaging is seriously amazing for this palette, with a sparkly and textured granite-esque casing. Open it up and you'll find a large mirror in the reverse lid and eight pans of glitter eyeshadow heaven. 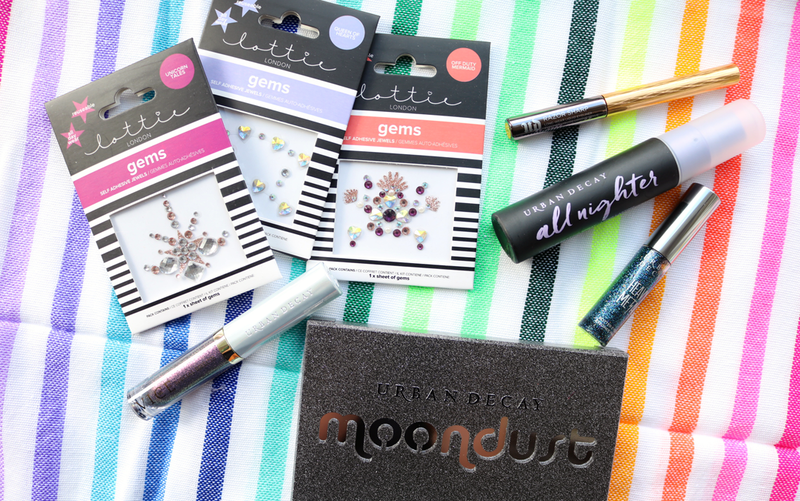 These eyeshadows are insanely glittery and pigmented, and you can use them dry for a sheerer look or wet for a proper intense, full-on festival-ready finish. I've swatched with just two dry swipes below to give you an idea of what these beauties can do and I love the range of colours. They wear well with minimal fallout and look even more mesmerizing on the lids. 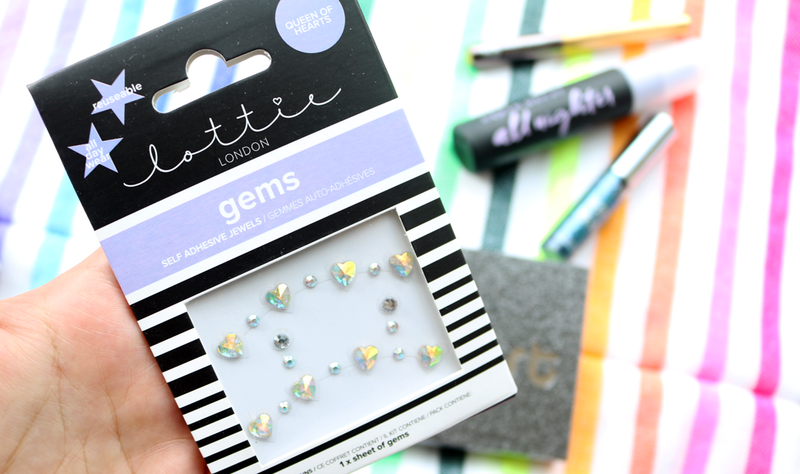 If you enjoy experimenting with your makeup - this is a must-have! To amplify your makeup further, a colourful liquid eyeliner can really pull the whole eye look together and I've been having fun trying out one of Urban Decay's Razor Sharp Long-Wear Liquid Eyeliners. These have a super fine tip which makes applying the liner much easier as you can get a really precise skinny line and they stay put all day, with incredible pigmentation. You do have to shake the tube a couple of times to ensure that the formula is thoroughly mixed, but when you get it right, the colour and payoff is worth is the wait! These liners come in a range of shades and I have Goldrush which is a killer metallic gold colour. 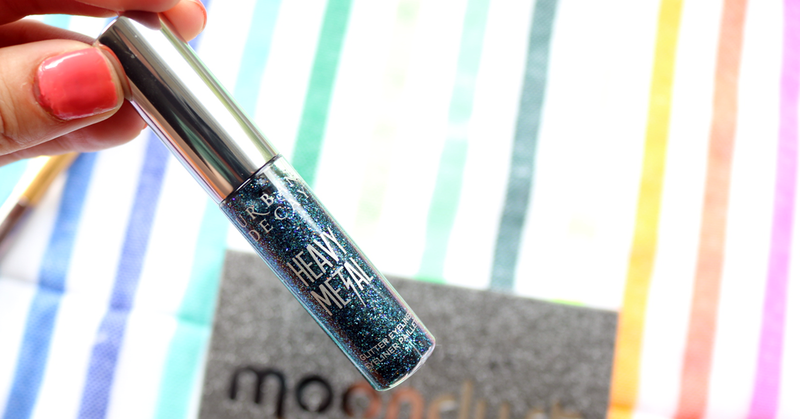 If you only want a smidge of glitter on your eyes, try one of Urban Decay's hugely popular Heavy Metal Glitter Eyeliners. The wand tip is very fine so you can easily achieve a skinny sliver of glitter or build it up for a thicker line which I've done in the swatches below. As you can see, the glitter is in a clear base, so these can be worn on their own or you can layer them over a black liner or shadow to really make them pop. They stay on all day and night (basically until you want to take them off), so you can see why they are such a coveted product in many a makeup artist's festival beauty bag. Available in a number of shades, I have Spandex which is an explosive mix of iridescent glitter with blue, black, silver, green and fuschia particles. Glitter lips continue to be a big trend, especially during the Summer months and holiday/festival season. Urban Decay have these cool Vice Special Effects Lip Top Coats which you can layer over your favourite lipstick for a completely different and unique look. You can also wear them on their own, but I find that they look much better layered over a lip colour, especially a darker one for an intense and vampy lip. They feel a little drying on, so make sure that you use a lip balm underneath. I have the shade Reverb which is a black, purple and silver glitter mix. Swatches! Urban Decay Razor Sharp Long-Wear Liquid Eyeliner in Goldrush, Urban Decay Heavy Metal Glitter Eyeliner in Spandex and Urban Decay Vice Special Effects Lip Top Coat in Reverb. For makeup that is going to stand up to the heat and last all day/night long, a high-quality setting spray is an absolute must. 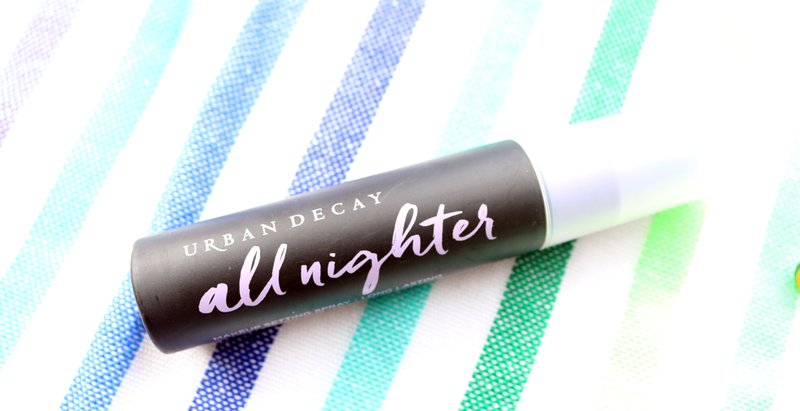 I've been using Urban Decay's All Nighter Makeup Setting Spray for years and I've yet to find anything that works as well as this bad boy does. A quick spritz done twice all over the face will ensure that your makeup is put on lock down until you want to take it off. This 30ml travel size bottle is also perfect for holidays and handbags. 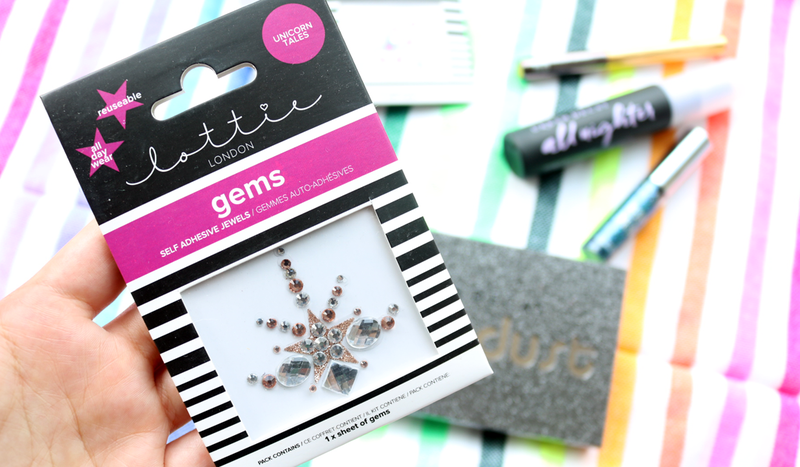 To finish everything off, why not pick up a pack of these new Gems from Lottie London? 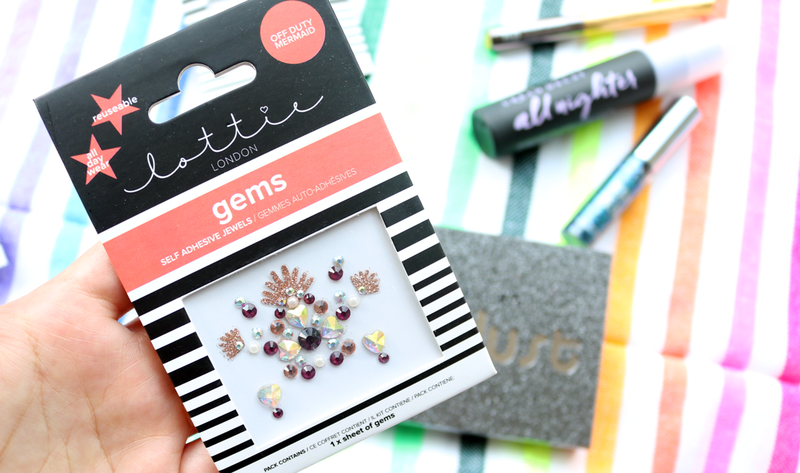 These self-adhesive jewels will add some instant bling and festival fun to your look, plus they'll stay on all day and are reusable for your next festival adventure (just add a dot of lash glue to the back of them when re-using and you'll be good to go!). There are lots of different designs available, but I think Unicorn Tales may have to be my favourite! The Urban Decay shadows look insanely pigmented. I don't do eyeshadow very often but they look like perfect prezzie for my sis who looks a bold eye.